reads: "2009 Prima Creations, Inc. Yorba Linda, CA, Made in China." On loan from the NC Headgear Archive. If this hat looks vaguely familiar, that's because it is sort of like (but totally different in color from) Hat 37 (which also hails from the NC Series). That one has a sort of summer/fall look, while this one is full winter holiday season. The way I look at it, take the two of them together and you've got ... wait for it ... a pair of jokers. Day Sixty-Four / Hat Sixty-Four: Rainbow-colored umbrella hat with white elastic headband inside. I'm going to come right out and say this is my absolute favorite hat to date. Not just because it's a colorful, unique addition to the Project, but because of its provenance. This hat was hand-delivered to the Cube Farm last Friday from Beijing, China, where it was purchased by Grace, the daughter of my Travel Section colleague Chris Reynolds. "Everybody who is anybody is wearing these, especially in Beijing," Reynolds tells me. "Grace bought this right on Tianamen Square outside the Forbidden City." According to Reynolds, the price of the rainbow lid was 10 Chinese yuan, with the current exchange rate being somewhere in the neighborhood of six Yuan to one U.S. dollar. This thing has such a wide wingspan it was almost beyond my selfie-taking abilities. I did eventually manage to shoot myself and provide you all with some meaty forearms and my favorite new Orvis shirt at the same time. A sincere tip o' the festive and fantastical umbrella hat to Grace (who can rest assured that the hat in question has, indeed, been safely repatriated to her father's desk). 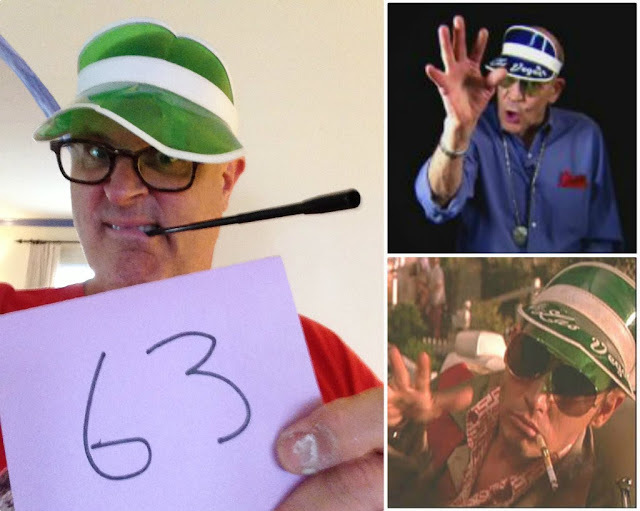 Clockwise from left, Adam waxing Thompsonesque in Hat 63, Hunter S. Thompson in a blue visor, Johnny Depp in a green visor. Day Sixty-Three / Hat Sixty-Three: Green transparent and white opaque plastic visor accessorized with black plastic telescoping cigarette holder (from the Bride's Cruella De Vil costume of several Halloweens back) to achieve a pseudo Hunter S. Thompsonesque vibe. For those of you who didn't know, I'm a huge fan of Thompson's work and he was one of the reasons I ultimately decided to pursue a career in journalism. I actually even had a chance to meet him once (well, shake his hand at any rate) when he came to the Viper Room in West Hollywood to give a talk. The most distinct memory I have is seeing him pull up outside with Johnny Depp and John Cusack in a huge convertible, holding an inflatable doll by one heel as it bobbed and flapped out of the back of the car like a child's kite. (Here's a link to photographic evidence someone else has posted on the Internet). I don't know exactly when that was, but according to this non-official fan site of the Viper Room, it was in September 1996. That would make sense since the other thing I remember is that within 24 hours of shaking Thompson's hand, I shook then First Lady Hillary Clinton's hand during a Rock the Vote appearance at the 8000 Sunset shopping center, where she was campaigning for her husband who would win his second term that November. Day Sixty-One / Hat Sixty-One: Purple trucker-style cap with foam front, mesh back and white Trask Industries logo on front. This awesome lid comes to the Project from comic book geek, former LAT colleague and current senior writer at Entertainment Weekly Geoff Boucher along with an explanation. "This is a giveaway for 'X-Men: Days of Future Past'," writes Boucher. "Trask Industries makes the Sentinels, which are like Skynet [from the 'Terminator' films] plus the androids from 'Westworld' in a way. Peter Dinklage plays CEO Bolivar Trask in the film." A sincere tip o' the hat to G.B. for so much geeky comic book goodness. logo on front, red, white and blue embroidered American flag on right and gold accent on edge of bill. Since this is on loan from the NC series, I suspected the NRA in question might be the National Restaurant Association -- or at least I did until I saw the selfsame hat available for purchase here. Now I've decided that the only way she's going to get this one back is by prying it from my cold, dead head. Day Fifty-Nine / Hat Fifty-Nine: Black Chinese-style skullcap of stiff, satin-like material with knot of red corded braid on top and red circular Asian-inspired design on front. Another hat from the very fruitful NC series, the interior of this cap is red and still bears the original price tag ($7.50) and with its place of manufacture also stamped inside in black ink. Yes, it reads: "Made in China." Day Fifty-Eight / Hat Fifty-Eight: Two-tone plastic Viking helmet from the NC series with interior sticker that reads: "Not Suitable for Children Under 36 Months." Do they really need to tell us this? Everyone knows that under 36 months og age, a baby Viking would only be wearing a helmet with l'il nubbin horns on it. rectangle logo that reads: "NAT GEO WILD," loaned to Project Cubbins by my favorite shepherdess (yes, it's on her business card) Natalie Redding of Temecula's Namaste Farms. I think the brand-new, fresh out of the wrapper hat might actually be a hint at something else on the horizon, but so far Natalie has been mum on that. We first met several years ago after she invited me -- nay, harangued me -- to check out the wool and fiber from her champion Wensleydale, Teeswater and Gotland sheep, and champion Pygora and Angora goats (a link to that story below). Whatever it is, the "yarn-trepreneur" will undoubtedly excel at it. I may have a head for hats, but Redding's got a way to spin the yarn business that's downright entrancing. And that's not pulling wool over anyone's eyes either. Day Fifty-Six / Hat Fifty-Six: Black, cotton, made-in-the-U.S.A. baseball-style cap with multi-color embroidered Hard Rock Cafe logo surrounded by the words: Save the Planet (above) and "Los Angeles" (below). The Hard Rock Cafe at which I purchased said hat is long gone now -- it was located at the corner of San Vicente and Beverly (a street-level anchor tenant of the Beverly Center), and I'm sure no one could have imagined that sixteen years later the Bride and I (whom I had yet to officially meet-cute) would purchase a home barely a mile away. PC 9: Vermont '79 -- Where Were You? Day Fifty-Five / Hat Fifty-Five: Red, white and blue "Uncle Sam" style top hat. 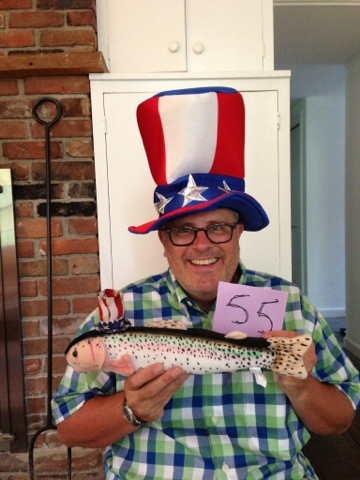 Note matching hat worn by my shoulder trout Gilly. I made Gilly's hat myself several Fourth of Julys ago from an Independence Day themed cocktail napkin. Gilly also has a pair of stylin' earmuffs (gillmuffs?) for the winter season. Day Fifty-Four / Hat Fifty-Four: Beige corduroy cap with embroidered Orvis logo altered to read: "L.L. Orvis." Another hat from the Douglas A. Tschorn collection, and a gift (in its altered state) to him from a long-ago Orvis employee playing on the similarity/differences between the locally based Orvis Company and L.L. Bean of Freeport, Maine. I managed to infiltrate the Wayside Country Store and take this shot before anyone knew I was even there. 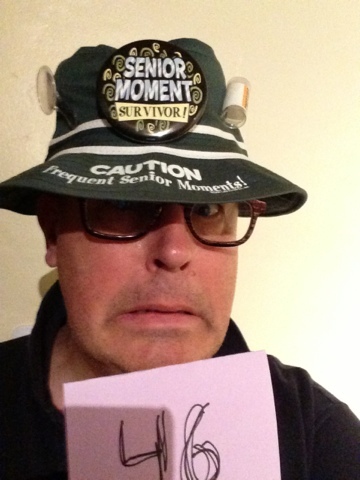 So let this be a lesson: lock up your hats lest they become blog fodder. Day Fifty-Three / Hat Fifty-Three: Vintage pink felt lady's hat with pink feather and jewel flourish. Tag inside reads: "Evelyn Varon model" with size tag that reads: "22." Me sporting a tricorne (left), property of nephew Preston McClary (right). Day Fifty-Two / Hat Fifty-Two: Revolutionary War style black felt tricorne with metal snaps. Loaned from the personal collection of nephew Preston Douglas McClary (pictured above right) on the occasion of his 17th birthday. Preston brought the hat south from Burlington as I headed north from Manchester and we met at Fort Ticonderoga, New York, (slogans include: "Two wars, five battles, one fort," and "America's Fort,.") where we and his mom (sister Sue) spent the day checking out the fort, which happens to be one of my favorite historical sites. Hat 50 (left) with interior detail (right). Day Fifty / Hat Fifty: In honor of the first (albeit very tiny) milestone of fifty hats -- one tenth of the way to the big 500 -- I've chosen a very, very special hat. It's a brown 4X beaver felt ten-gallon cowboy hat with multi-color Native American influenced woven hatband, interior tag reads "John B. Stetson Company" and size tag reads "7 1/4." Inside the crown is a multicolored silk depiction of a cowboy giving his horse a drink of water from his own cowboy hat. 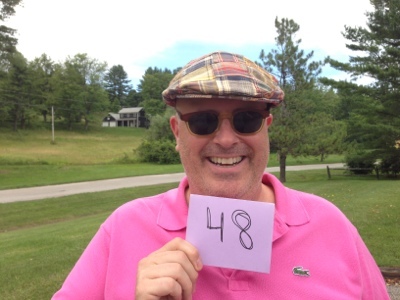 This hat was gift to me many years ago -- I'm going to say close to forty years ago -- by my Uncle John Schweitzer. He also bought a matching one for my older brother Allan. There are random photos of us with these huge genuine cowboy hats over the years, but they always seemed too big for our still-growing heads. My sainted mother, wanting to make sure the hat and I stayed together, handed it off to me with great solemnity last year during a reclamation of former childhood bedroom space. It has been sitting here in the Vermont closet ever since, never quite having made the trip back to L.A.
A funny thing happened when I pulled it out of the closet and dusted it off for this Project entry a few minutes ago: I tipped it up onto my head, expecting, as always, to be swimming in it, and -- for the very first time in my entire life -- that forty-year-old cowboy hat fit absolutely perfectly. And sometimes you grow into your own hat. Fifty down and four hundred and fifty left to go. Day Forty-Nine / Hat Forty-Nine: 100% cardboard Miller Lite 12-pack box. Before anyone gets their hat hackles up (see the Facebook comments regarding my pink Tommy Hilfiger do-rag), note that the Project has always been about hats and headgear of all sorts. And when you're looking down the barrel of 500 chapeaux, you don't just need to end creatively, you need to start creatively too. Also, anyone who knew me back in my college days knows this was one of my standard party tricks. Day Forty-Eight / Hat Forty-Eight: 100% cotton patchwork madras driving cap from Orvis and purchased today at the Manchester, VT, flagship store. Bride and sister-in-law both approve, but just noted that thanks to the rest of my outfit - a pink Lacoste and weathered green Old Navy cargo shorts - I'm kind of rocking a golf caddy look. Day Forty-Seven / Hat Forty-Seven: Gray baseball-style cap with multi-color embroidery that reads: "Vermont Mega Millions with Megaplier" and logo. The first (but probably not the last) hat from the DougTschorn series. Much of the collection can be seen in the center photo above, hanging in a place of honor beside his desk at the Wayside Country Store. 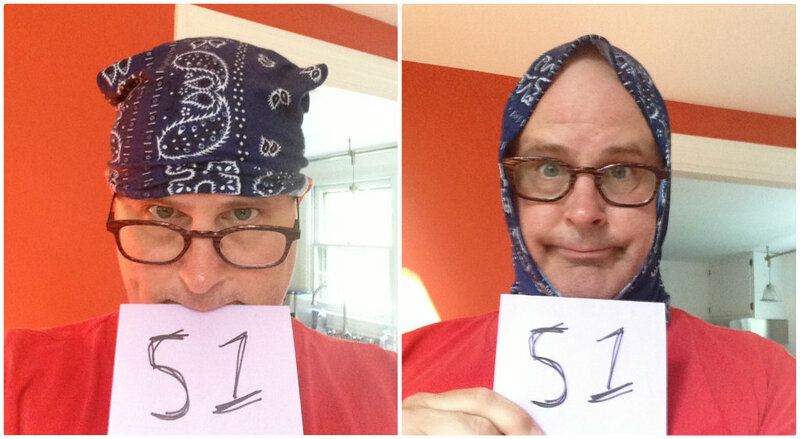 The aforementioned Doug is my father, so you can see the collecting of headgear is something that runs in the family. Speaking of running in the family, that's my sainted mother, Nancy, in the far right photo. L.A. folks might remember her as "the reindeer's mother" from Heather's holiday part of a few years back. As for the provenance of the hat, dad tells me it was given to him by the "the Vermont Lottery Commission guy" and "about a year ago." Why was this hat chosen? My godson nephew Spencer said: "That one." And the godfather delivered. Day Forty-Six / Hat Forty-Six: Senior Moments bucket hat in forest green, loaned to Project Cubbins by the good doctor. While I don't yet suffer from said "senior moments," getting up at this time of day makes me feel like I do. Day Forty-Five / Hat Forty-Five: Pink felt Happy birthday four-candle headband with interior label that reads "The Great PretendEars, Hanover Accessories Inc."
Worn in observance of the Bride's birthday. From the beginning of Project Cubbins she's been saying: "You should do theme hats for certain days," and things of that nature. While I don't have much of a head for scheduling, planning and logistics, I do have a head for cake, so this entry has been on deck since Day One / Hat One. Day Forty-Four / Hat Forty-Four: Green 100% cotton baseball-style cap with yellow and green embroidered John Deere logo and name (on front) and the slogan: "Nothing Runs Like a Deere" in yellow embroidery on the back. Another hat in the fruitful NC series. The John Deere company make a lot of hay with its roots in the Midwest as evidenced by this timeline entry at its website: "1837 John Deere fashions a polished-steel plow in his Grand Detour, Illinois, blacksmith shop that lets pioneer farmers cut clean furrows through sticky Midwest prairie soil." But any good Vermonter (a goodly number of transplants) know that inventor John Deere was not only born in the Green Mountain State (in Rutland in 1804), but learned the blacksmith trade in Middlebury "as an apprentice in the shop of Capt. Benjamin Lawrence from 1821 to 1825," as the Vermont Board of Historic Sites marker currently in place puts it. As the marker also states: "In 1836 Deere removed to Grand Detour, Illinois where, in 1837, he built the world's first steel moldboard plow." Anyone who had tended the rock garden that is Vermont's unforgiving soil will probably agree that while "the Plow That Broke the Plains" may have been invented in Illinois, the seeds for it were almost certainly sown back in Vermont. PC 43: Yodel hey, he who? Day Forty-Three / Hat Forty-Three: Red felt hat, with forest green twisted cord hatband and gamsbart pin from the NC series. Interior sticker reads: "Made in Germany." By my reckoning this is the second German hat of the project and, so far, the one that hews most closely to that Bartholomew Cubbins himself wore (though I'm hoping to get my hands -- and head -- on an exact replica before this is all over). Fancy a Hat Beard for that Buttonhole? Day Forty-Two / Hat Forty-Two: Floral print baseball-style cap with leather Toms logo appliqué and metal grommet details. From the Bride's personal collection. 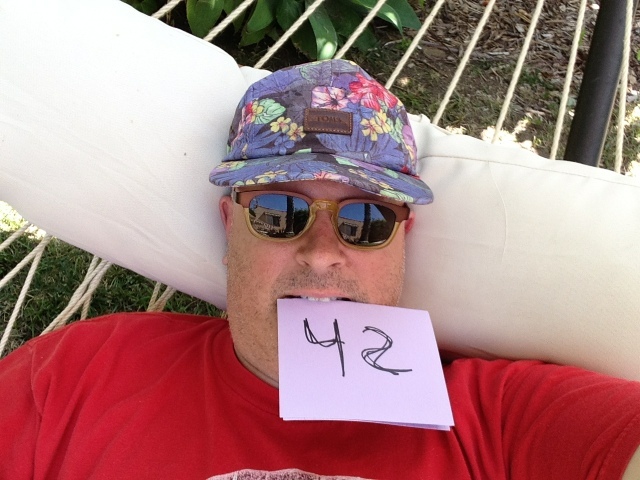 FYI, today's post comes from the hammock in the back yard. If you look close enough, you can see the reflection of the house in my sunglasses, as well as the trunk of Steve, our palm tree. "Casual Friday" embroidered in lower right corner and held in place by a red, white and blue terrycloth sweatband. Did you know that etymologically, it's the colors and spots that make it a bandana (also frequently spelled "bandanna")? That's what the Online Etymology Dictionary says anyway: "from Hindi bandhnu, a method of dyeing, from Sanskrit badhnati "binds" (because the cloth is tied like modern tie-dye)." This particular bandana came from the 2011 Tommy Hilfiger Prep World pop-up at the Grove.That it perfectly matches my hat number index card is coincidence. Day Forty / Hat Forty: Multi-colored woven sun hat with pink straw band. Interior tags read "100% straw Made in Italy," and "Daniele Meucci, Florence, Italy." Borrowed from the Bride's collection. Of its provenance she says: "I think that was Loehmann's purchase -- you can always find a good sun hat at Loehmann's." Without carbon dating, the best guess is it's been part of her headgear collection for about seven years. 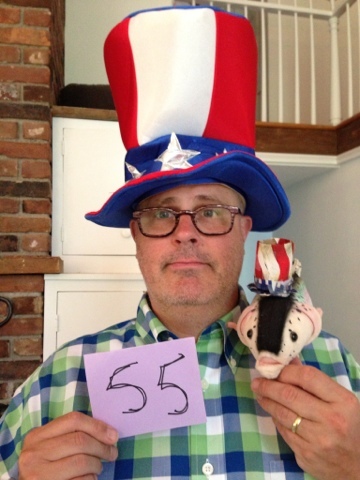 PC 39: Top hat, America! Day Thirty-Nine / Hat Thirty-Nine: Red, white and blue felt top hat style headband with label that reads: "The Great PretendEars, Hanover Accessories Inc."
embroidery in black above embroidered slogan that reads: "Throw your tails in the air." Additional orange embroidery on the back of the hat reads: "ASPCA we are their voice." This hat was a gift from my father-in-law (otherwise known as "the Admiral"). Make of that what you will -- the tail-throwing and all -- but rest assured that the mental image you immediately conjured up of me in full feline downward dog (which, I apologize, you will most likely now carry with you forever) is more than offset by knowing there are many a cat and cat shelter whose lives have been bettered thanks to the Admiral's beneficence. I just went to the ASPCA's website to see if this particular hat was still available. While it is not, I did find this one that would certainly be an appropriate candidate for Project Cubbins at some point down the line. PC 36: You the dog now, man! Day Thirty-Seven / Hat Thirty-Seven: Green color-blocked felt tri-tipped jester's cap with white puffball tips, courtesy of the NC series. This would be the perfect hat for the imaginary job I think I'd be good at: corporate jester. Just imagine me pulling up a seat at a company's board meeting in a suit and tie and this lid. Day Thirty-Six / Hat Thirty-Six: Ewok cap with ears from the NC Series. This happens to be the most hair that's been on my head in years. I had a vague feeling of déjà vu when I saw what I looked like rocking this lid, and then it hit me: I felt a little like the late, great John Candy playing the half-man / half-dawg (make that "mawg") named Barf in Mel Brooks' sci-fi parody "Spaceballs."